Every month we hold free legal clinics in Kingsbridge and Dartmouth. This month we saw people with a variety of issues including queries about lasting powers of attorney and landlord and tenant problems. 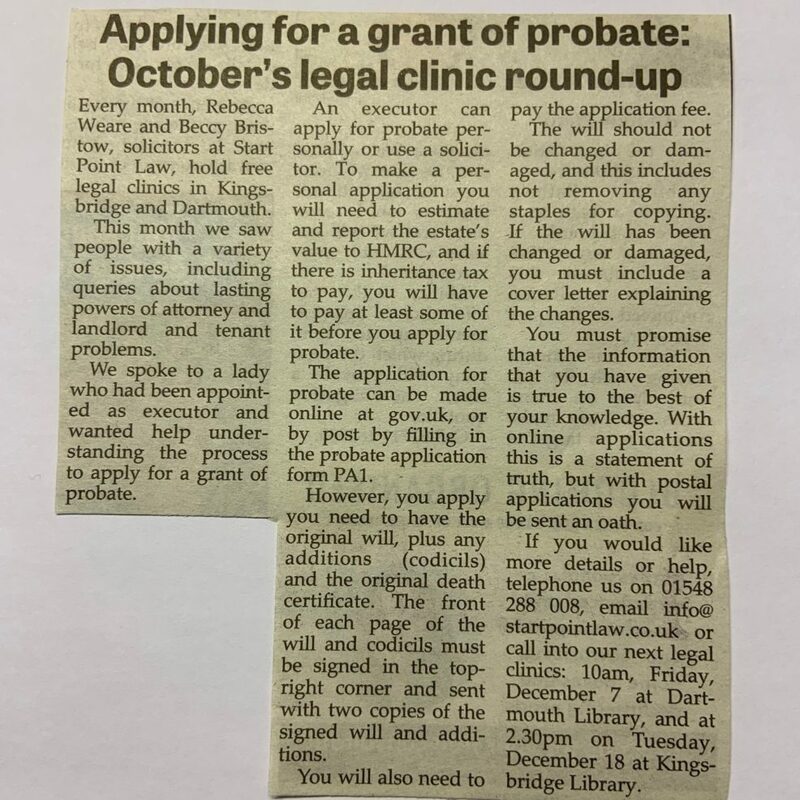 We spoke to a lady who had been appointed as executor and wanted some help understanding the process to apply for a Grant of Probate. An executor can apply for probate personally or use a solicitor. To make a personal application you will need to estimate and report the estate’s value to HMRC, and if there is Inheritance Tax to pay, you will have to pay at least some of it before you apply for probate. The application for probate can be made online, www.gov.uk, or by post by filling in the probate application form PA1. However, you apply you need to have the original will, plus any additions (codicils) and the original death certificate. The front of each page of the Will and codicils must be signed in the top right corner and sent with 2 copies of the signed will and additions. You will also need to pay the application fee. The will should not be changed or damaged and this includes not removing any staples for copying. If the will has been changed or damaged, you must include a cover letter explaining the changes. You must promise that the information that you have given is true to the best of your knowledge, with online applications this is a statement of truth, but with postal applications you will be sent an oath.